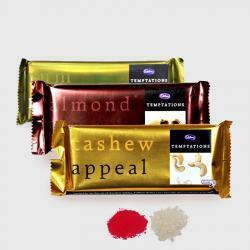 Product Consists : Hand Bouquet of 15 Mix Flowers, 2 Bars of Temptation Chocolates (Weight : 72 Gms each) along with Free Roli Chawal. Spectacular vase containing ravishing flowers is all set to take away your dear ones heart. The Vase has mix seasonal flowers. Flowers serve the bets as gifts on any occasion or festival. 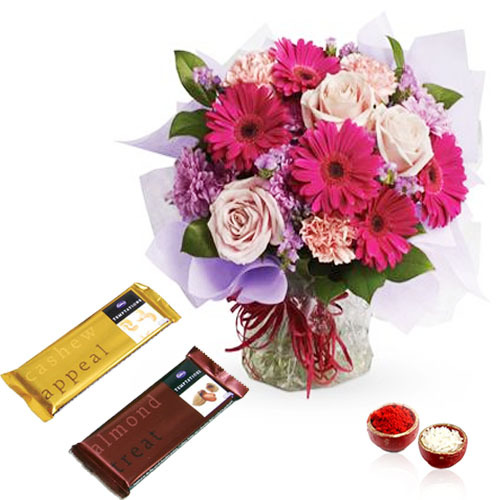 Along with the flower vase arrangement, we also have put together Roli Chawal and a Temptation Chocolate. There is something about fresh flowers that speaks volumes about your feelings. If you are wondering what to gift to your brother. Flowers are bloomed perfectly and look fresh and exciting. 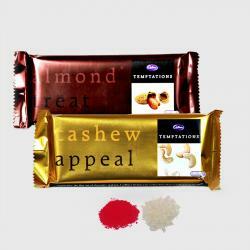 Temptation Chocolate is embedded with exotic ingredients and comes in a variety of delectable flavours. Gift this extremely delicious Hamper to your loved ones as an expression of your love on Bhai Dooj. 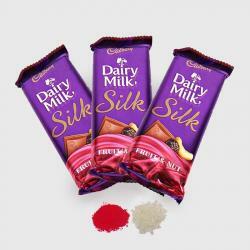 Product Consists : Hand Bouquet of 15 Mix Flowers, 2 Bars of Temptation Chocolates (Weight : 72 Gms each) along with Free Roli Chawal.